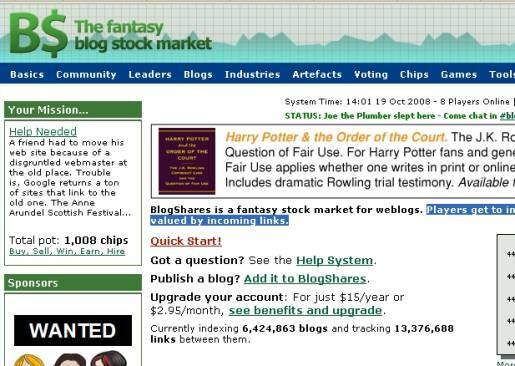 Blogshares, today’s site of the day, is a fantasy blog stock market. For those who feel the need to invest in stock without the risk of a Black Monday, here’s a way to virtually earn millions. The secret is to recognize blogs that are likely to become popular and invest in them soon after they are launched. The Inspiration Room Daily is in the process of being listed. BlogShares is a fantasy stock market where weblogs are the companies. Players invest fictional dollars in a wide spectrum of blogs. Blogs are valued by both incoming and outgoing links, and can add value to other blogs by linking to them. Prices increase or decrease based on trading and the underlying value of the blog. No actual ownership of blogs is transferred: BlogShares is purely a fictional marketplace for entertainment purposes only. BlogShares was written in early 2003 by Seyed Razavi in his free time. The overall objective of BlogShares is the exploration of an emerging social network while providing an addictive and fun environment for bloggers to join and help add to the worth of the social network. Another one of the purposes of this site was to prove the Power Law theory. Part of this theory is based on the fact that 20% of the population holds 80% of the wealth. This can also be attributed to weblogs. 20% of the blogs contain 80% of all incoming links. BlogShares hits a home run with this theory. The BlogShares project took off rather quickly and was considered a personal success. The site, however, was a success that would not last. BlogShares suffered from a few serious coding issues that severely hampered the site’s growth and expansion, as well as its speed. At this point, BlogShares was tracking 400 thousand blogs and links. Eventually these took their toll on the BlogShares hard drives and a catastrophic system failure ground BlogShares to a halt. That, bundled with personal reasons, caused Seyed to choose to leave the game. At this time, BlogShares was taken over by its current owner Jay Campbell, and co-administered by C. Suburban Wolf (AKA Rob/SubWolf) was brought on almost immediately to help recode the entire site. Once BlogShares was taken out of the beta stages its popularity sky-rocketed. Today, BlogShares has become the most immersive online Stock Market simulation available, as well as the most popular with over 40 thousand active users. Over 17 thousand blogs have been claimed by their owners. Even more amazing is the sheer number of blogs currently tracked: 7.3 million.